These images were near the Beaver Heritage Museum. A Civil War era home is located at the edge of the property and presents many tremendous photo opportunities. 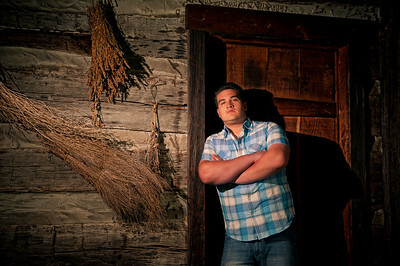 The rustic nature of the building is a tremendous back drop and setting for Drew's High School Senior Portraits. 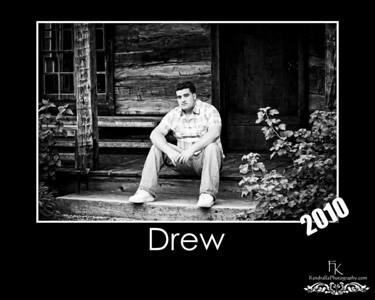 As you can see from the images, Drew has a large frame and a rugged setting was appropriate for his session. The evening was perfect, overcast skies with enough light to cast some fun shadows. I used off camera lighting with no difuser or umbrella on a light stand, camera left for most of the images in his shoot. A few of the images, I underexposed the scene by 2+ stops and filled the image with directional light to create a sunset look. This technique is critical to learn, especially living in an area where we go days and maybe weeks without any great sunsets. However, when shooting portraits, I would rather have a dull sky and create my own sunset with either an off camera flash or video light. These tricks can be used in many portrait settings and not only outdoors. Experiment with underexposing (use manual exposure on your camera) the scene and filling just the area you want with directional off camera lighting. With this technique you can create many different and interesting looks in your portraits. Contact Me to photograph your Wedding or High School Senior Portrait in the Pittsburgh area. As always, get out and enjoy the beauty of life.